Want me to hang. Cause I'm back on the track, and I'm beatin' the flack. 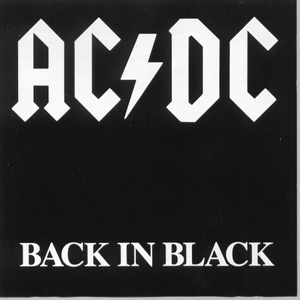 Released on 25 July 1980, Back in Black was the first AC/DC album recorded without former lead singer Bon Scott, who died on 19 February 1980 at the age of 33, and was dedicated to him. The band considered disbanding following Scott's death, but they ultimately decided to continue, with encouragement from Scott's parents, and shortly thereafter hired Brian Johnson as their new lead singer and lyricist. Producer Robert John "Mutt" Lange, who had previously worked with AC/DC on Highway to Hell, was again brought in to produce. The album was recorded at Compass Point Studios in Nassau, Bahamas, and Electric Lady Studios in New York, where the album was also mixed. The album was recorded at Compass Point Studios in The Bahamas. It was not easy for the band, as their equipment was initially held up by customs, and the island was overcome with tropical storms that wreaked havoc on the studio's electricity. Johnson reported having trouble adjusting to the environment, and even referenced the bad weather on the opening lines of "Hells Bells" ("I'm rolling thunder, pourin' rain. I'm comin' on like a hurricane. My lightning's flashing across the sky. You're only young but you're gonna die. ").